Guys. 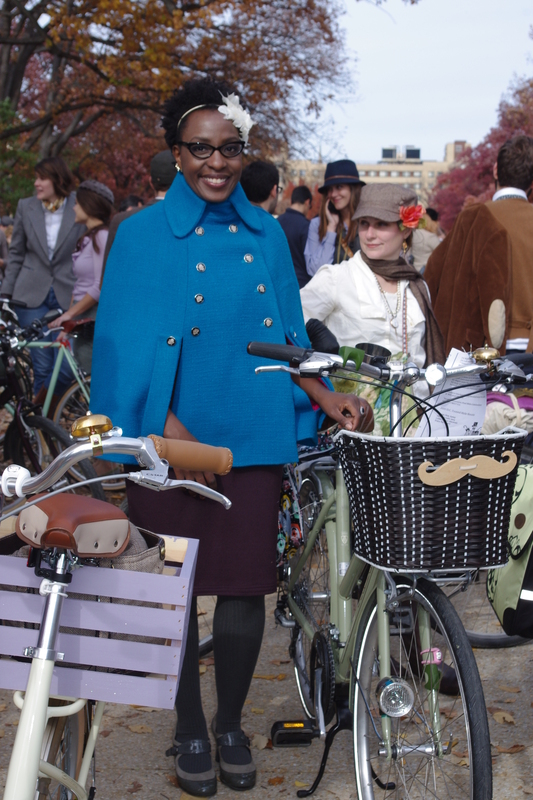 I was seriously just plowing through this cape to have something for the 10-mile DC Tweed Ride. It wasn’t until I finished the cape that I fell IN FREAKING LOVE with it!!! With over 900 people registered for the ride, I was definitely in a color that stood out. 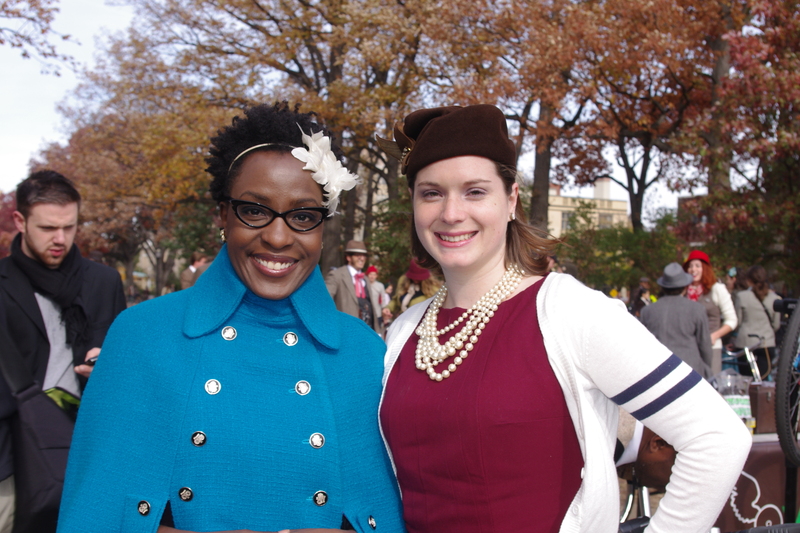 The BEST thing about this cape is that so many tweed riders were in darker fall colors. This turquoise blue just *popped*. I was nervous in general about how bright the blue is. It’s not a color I normally wear. My original fabric was a dark gray tweed, but I ran out of material and used this blue from the Carol Collection instead. A good indicator of your outfit on these rides is how many people ask for photos or tell you they like your outfit. Liz is wearing my Burda jumper, 10-2009-119. Liz and I did *ok* during the Seersucker Social. But, we were on fire at Sunday’s ride. I borrowed the white feather fascinator from her. I’d love to be in a hat. But, my head is just too big for vintage and even modern hats are generally pushing it. The cape was finished on Friday. But, the buttons will NOT stay on. They are metal and shank. And, all four buttons on the opening edge have been resewn at least two times each. Three fell off on Saturday night. Two fell off before the ride on Sunday. Two fell off during the ride and now, on Monday morning, another fell off. 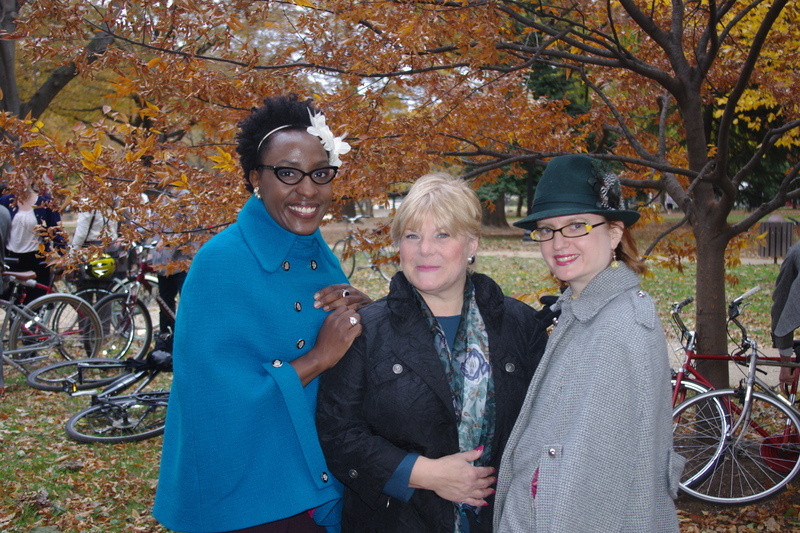 In fact, in the photo above Trena and I are with Claudia. She’s a DC dweller who reads our blogs. She saw the ride go by and happened upon us! Good for me, because she sewed one of my buttons back on!! I *think* the rough metal shank is just cutting through the double strand of thread. I’m going to reattach with coat / button thread and see if that will help. I’m wearing a knit Burda jumper, 9-2007-121. It had a classic look with my shoes. I lined the cape with a stunning raspberry material, also of the Carol Collection. It gives an amazing double whammy of color. The blue wool is fully interfaced, which happily did not stop me from having beautiful, crisp edges. It can be worn open, and not buttoned. That does make it easier to *do* things. Capes are totally and completely impractical, but I have a serious thing for them and trench coats. I guess it’s kind of that military influence, no? The cape is PERFECT for this kind of ride and (I’m told) looks great while biking. Our ride took us around downtown DC. I couldn’t resist a photo in front of the White House. We also biked past the National’s Stadium, the Capitol Building, and through Chinatown. I’m not sure there is anyone Chinese in DC’s Chinatown…. 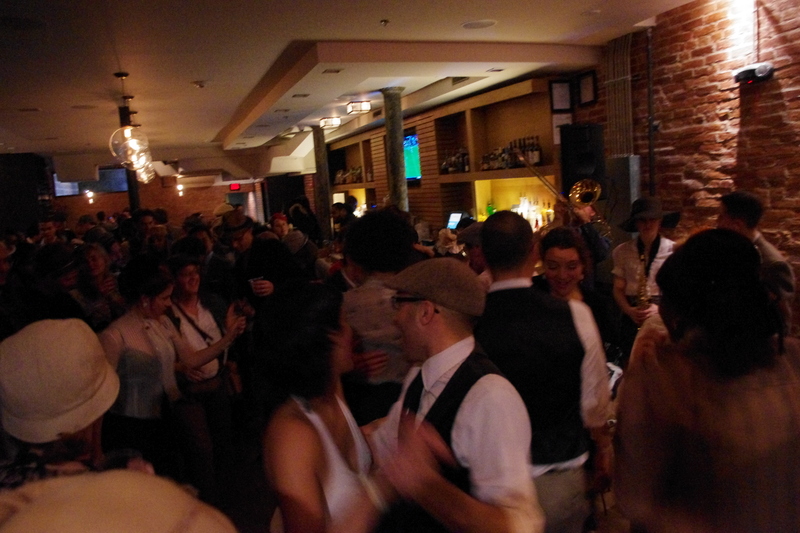 The night ended at Smith’s just outside of Capital Hill with a live band, gin drinks and fun! 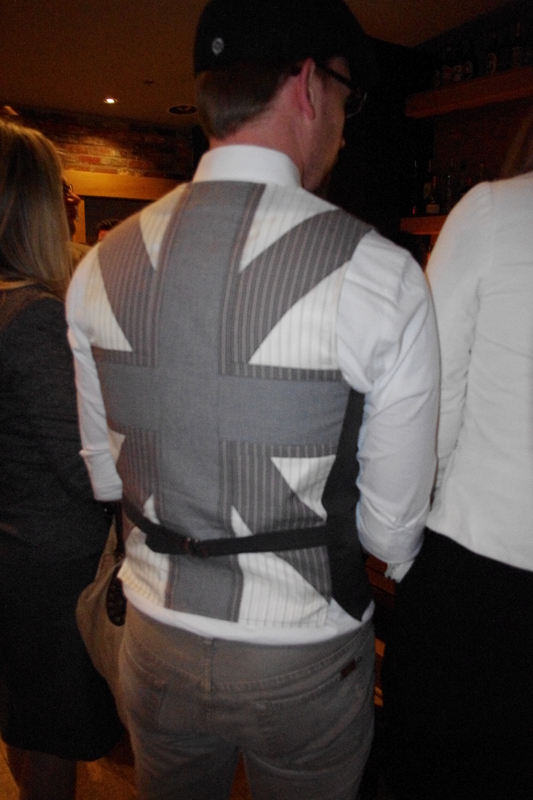 I fell in love with this guy’s vest. Someone (a UK National) recently told me I’d fetished the whole Brit thing. True Dat. We were wiped out oat the end of the night. I just love this photo! 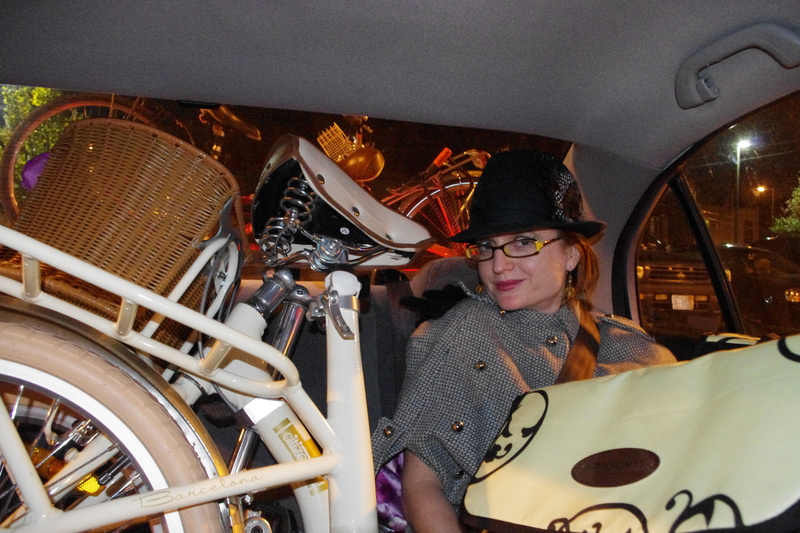 Liz has a folding bike so we popped that in the back seat. That’s Trena next to the bike with two more bikes out back! These rides are so much fun! You get dressed up, you get to bike and see the city and the people are all just incredibly cool. I’m already planning next year’s outfit! Next Post A #WINNING Thank You! Is the shank completely closed? Maybe it’s slipping off the thread as it moves. It’s completely closed. The inside of the shank seems smooth. But, the outside is a little rough / jagged. The buttons are cutting right through the waxed, doubled thread. Paint the shanks with clear nail polish. That should smooth out the rough edges enough that they won’t saw thru the thread quite so fast. I absolutely love your cape (and the tweed event)! I’m a cyclist and sewer too – and investigating whether Tweed Ride is coming to LA! I love your pictures – thanks for sharing! Try using dental floss for sewing your buttons back on. You could always dye the floss….. 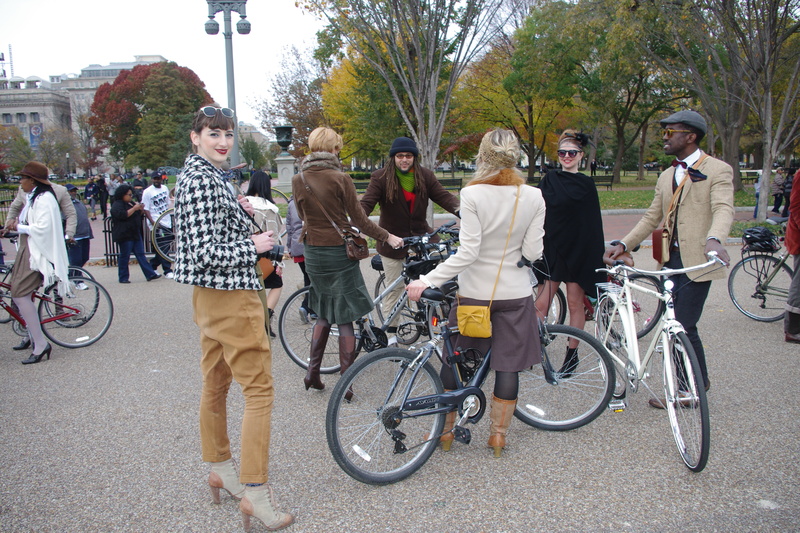 This blog, http://ridingpretty.blogspot.com/, keeps a running list of Tweed Rides both in and out of the US. I’m hoping they have one in Baltimore next year! Your cape is great, what a nice style that is! How terribly fun! Janet, good suggestion on dental floss. I was thinking about clear nail polish or a clear-drying glue to smooth on the inside edges of the shank. Your cape looks great with the fascinator! Do I recognize a BWOF knit dress too? I wish we had a Tweed Ride/Run in Brussels! I’ve had a similar problem with metal shank buttons in the past – I used a bead reamer to smooth them out. I told DH about the tweed ride and I think we’ll do it next year. Gives me a good reason to sew a cape. Try sewing the buttons on with dental floss. I love the cape! I suggest coating the pertinent parts of the button and shank with clear (or matching) nail polish to give a smooth protective coat to whatever is chewing the thread. You could also use an epoxy. 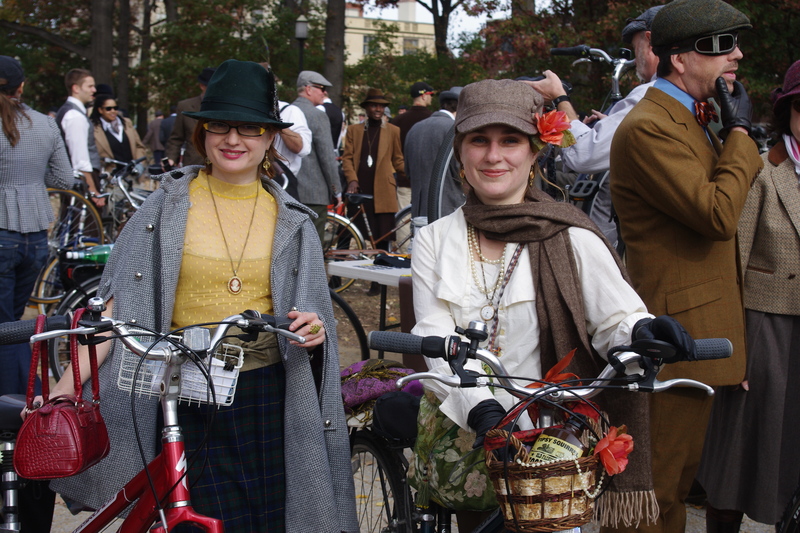 Our Tweed Ride in Dallas was yesterday too! We had a couple hundred people, not 900 though. The cape looks fantastic! Wow – it looks truly fabulous! And that lining!! Wow, what a great cape and a fun weekend activity. Maybe I’ll try to do it next year. What a fun cape! The blue is a gorgeous shade. I’m glad you had such a fun time! I had some metal buttons like that once. I don’t know what a bead reamer is but you could use wire from a plastic bag’s twist-tie or put a jump ring through each shank and then sew the jump rings to your coat. Forget about dental floss or waxed thread. They will inevitably be cut by the metal. You look beautiful in that cape! I love, love, love the color of the cape! Just awesome! Awesome!! I love bright colours for outer layers. Your whole outfit was just gorgeous. Always fun to see you and Trena having a nice time together. Wow. the colors totally are you, Cidell. Re the thread – try a buttonhole twist, maybe? Also…if the popping off buttons are a reason to carry a notions kit with you at ALL times I don’t know what it is. Thank goodness for that blogger en route! You know you have the prettiest smile! Seriously, the cape is working it and I love your outfit but your smile is what kept coming through in all the pictures. Glad you had a great time! Isn’t there a heavy duty type thread called buttonhole twist? Otherwise try dental floss. You look so marvelous in these shots. I wish I could have been in DC to enjoy the show! Your cape is one of the coolest ones I’ve seen. I love it done up in a bright color! This event looks like tons of fun. Fabulous color on you! It looks like you all had a great day. Really lovely! Hat – with your skills you can make your own! Buttons – maybe wrap with dental floss before sewing or sew on with dental floss? The ride looks like so much fun and you & your cape were outstanding. What fun! Just made myself a jacket the same colour – linen, as it’s summer in Australia. Love that colour! Re buttons – this has happened to me a couple of times, this last time I asked a haberdashery what I could use and she showed me a very strong cotton, and that has done the trick. Have even replaced a coat full of buttons in desperation, years ago. I totally LOVE your cape! I’m not a cape fan much, but the lining! And the colour! I love how you can get peeks of the raspberry through the arm openings. Love it! LOVE that beautiful blue! Your cape is fantastic. I also really like the glasses you are wearing in some of the photos. They suit you well. Awesome cape in a daring color! You roll with some stylish people! use a small straight ‘eye’ from a package of generic hooks and eyes…thread it through the button shank and then sew the ends down securely. The shank won’t cut through that and the eye won’t saw on the attaching thread. Long time lurker here. I was just looking through a Sewing with Nacy hints book and there were 2 suggestions for shank buttons. The first was to pin the buttons on with a safety pin. Makes them easy to remove for cleaning. The other method was to slip the “eye” portion of a hook and eye closure through the shank and sew the eye to the garment. I guess it would work with either a curved or straight eye. Your cape looks great and I enjoy all your sewing and other adventures. I just adore that color on you and you’ve converted me to the cape idea. Stunning Stunning Stunning. Both you and Trena look gorgeous. I wish I had been there. 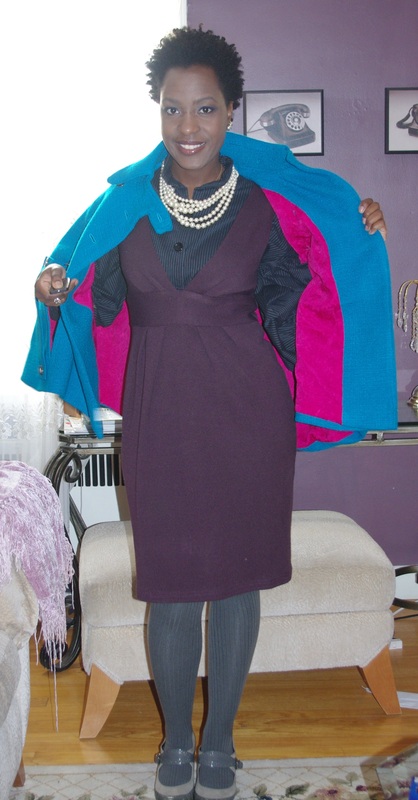 Fabulous cloak – the colour is great and I love the lining! 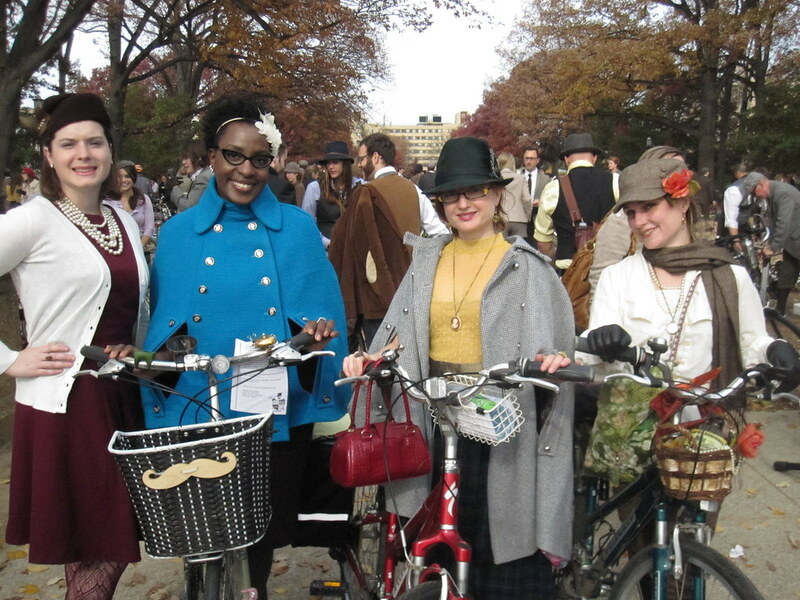 The tweed ride looks like a lot of fun. Love all the dressing up. Your cape looks stunning. Love the pop of color from the fashion fabric and the fun lining! It’s so beautiful, and a great color on you. I sent the link to mom, and she’s thrilled with how you used her fabric! Love the color of the cape. You may want to try sewing the buttons on with something like Firline or Wildfire – these are frequently used in beadwork, when the glass crystals would cut through normal thread. You can find spools of this stuff in the fishing section of the local sporting goods store. Absolutely fabulous! Love the blue and the whole outfit on you. I never thought a cape as seen in Burdas actually work in real life but this has me convinced that it does. The whole experience sounds totally fun as well. These are all great pictures and it’s brilliant to see everyone went to so much effort to look the part. Even so, you really stand out in your fabulous cape. Love, love, love your cape and you looked wonderful in your outfit. Congrats on winning! The cape is awesome, but those shoes slay me. What are they? If the dental floss doesn’t help you could always smooth everything down with tooth paste. I love the colour! That cape is simply stunning! The brighter color suits you right down to the ground and the fabric looks as though it were made just for this cape and nothing else. Things like this are why people sew for themselves. I just love your cape despite the button problems!! The color is beautiful and the workmanship is excellent. Great job! Hello! It’s my first time posting here, though I have been reading your blog for almost a year. I’m kind of the shy/lurker type of blog fan. BUT! I had to write to tell you how gorgeous you looked in your cape!! It’s stunning! And so flattering on you. And the burst of color in the lining was a great touch. It’s the kind of success I am always searching for when I take on my own sewing projects. It’s a lot of work, but sometimes, like your cape, it’s all very much worth the effort. P.S.Thanks for blogging. It’s such a pleasure to hear what you’re up to! You look great in that color! If filing the shanks, or nail polish doesn’t work, try wrapping the shanks in buttonhole thread before sewing them on. Maybe add a drop of fray stop stuff on top. This should pad the them so that as they move, they won’t cut thru the thread used to sew them on. And contrats on the Mobbie! This sounds so fun. Most of the rides we have around here are for die-hard athletes. Oh. Wow. This is absolutely stunning!!! You must be so happy with it. I’m so jealous! Pingback: Meetzorp » Blog Archive » Pending project – for the next Tweed Ride, maybe? I adore this; gorgeous color, so strong with the shape. I am in the midst of a cape crush of my own right now too and obsessing on various details- this kind of high, lobed collar is particularly nice. It looks smashing on you. Practicality pish posh, sometimes the lady needs her style, and you really have it in all respects with this outfit here! Love it all!! This is truly lovely and the color is exquisite.